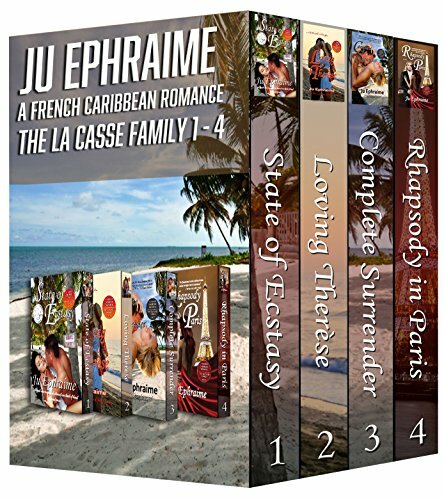 From bestselling author Ju Ephraime comes a Creole romance set on the beautiful French Caribbean island of Martinique that'll heat you up and have you running to the Caribbean for the off chance of meeting one of the LaCasse brothers, or maybe their sister. THE LACASSE BROTHERS’ LIVES ARE ANYTHING BUT ORDINARY. Restaurateur Wolfe LaCasse is trying to juggle his family restaurant while maintaining his love for swimming. When vacationer, Daphne Cohen invades his privacy by making his private beach her favorite hangout, Wolfe is HARD-pressed to resist her lure. Foxx LaCasse is a successful businessman with a love for soccer, which he indulges in every chance he gets. As a member of the local league, he has his pick of women. They are forever throwing themselves at him, and then he meets beautiful Therèse, who is visiting the island from the UK and he has a life-changing experience… He falls in love… HARD! His dilemma is how to convince her to stay and accept his proposal of marriage. Will she? Did she? Into this mix comes younger brother, Raymond, who has been away at university in Paris. He is now returning home to set up his own business, alongside his brothers. As luck would have it, or maybe the devil, who’s always in the mix, a chance encounter with Parisian, Gabrielle Descotte, a professional model has a powerful effect on him. Raymond has no hopes of ever seeing or meeting the beautiful model again, until fate lends a hand, and he finds something that belonging to her in his possession. He goes to great lengths find her to return the item… only, will he be able to let her walk away when he meets her again? The series ends with sister, Franchesca LaCasse, who has been in Paris, like her brother Raymond, studying at university. Now Franchesca is working as an accomplished biochemist for a large international firm in Paris. Her life is good, although sadly lacking in the love department. She is happy with her job until she falls while running on her company’s track and is rescued by the most handsome man she’s ever seen, and she’s seen her share, starting with her brothers. Disoriented, she is shocked into awareness when she feels his hand on her face, as he says, “Look at you,” in a thick, gravelly accent that goes straight to her heart. Without thinking, she agrees to let him accompany her to the hospital, a decision that has her questioning her sanity, even while he draws her like a moth to flame. There is no resisting the pull, even knowing she might get scorched in the end. These three brothers and the one sister are the youngest of the LaCasses. They are opinionated, alpha males and one female, whose brand of loving is like nothing you’ve encountered before. Sit back, grab a glass of wine and get ready to become HOT and BOTHERED! These are high heat romances, NOT erotica.